When you're reconciling transactions for the last month of your financial year, it's important to make sure the page only includes transactions up to the last day of that year. If the last bank statement for the year also includes transactions dated in the new financial year, you will need to create two reconciled pages to separate the previous year's transactions from the new year. Steph has a 30 June balance date. She is ready to reconcile her June transactions and notices her bank statement also includes July dated transactions. First, she draws a line to separate the 2017 dated transactions from the 2018 dated transactions. Then she makes a note of the account balance at 30 June 2017 and also at the end of the statement period. Opening Balance for the statement. Closing Balance as at the last day of the financial year. Statement Closing Date as at the last day of the financial year. This is an important step as it will prevent any later dated transactions from sneaking into the page. Click OK to start reconciling. Match all transactions that are listed on the statement and up to the recorded closing date. 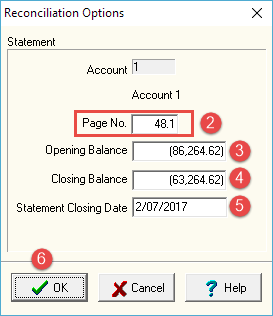 The page should balance as the closing balance for the selected period matches the computer closing balance. Click on the Reconcile button again. This will help you and your accountant to identify that though there are two pages in your database, they relate to the same physical bank statement. Opening Balance should match the closing balance of the previous page in Cashmanager i.e. 48. Closing Balance as at the last day of the statement period. Statement Closing Date as at the last day of the statement period. Match all remaining transactions that are listed up to the recorded closing date. 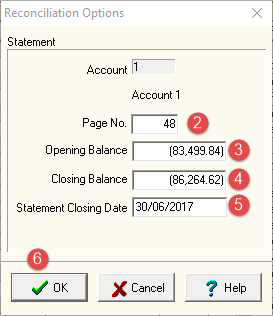 The page should balance as the statement closing balance matches the computer closing balance. Click Done to complete the process. How do I create a new financial year? How do I close a financial year? How to balance your livestock rec.